For the past decade, the CMA Songwriters Series has given the inside scoop to fans across the country on the songs that have impacted them. 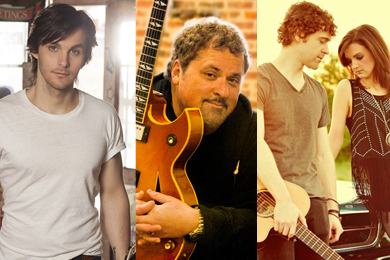 To celebrate the 10th anniversary, Bob DiPiero will take the stage alongside Striking Matches and Charlie Worsham at Joe’s Bar in Chicago on July 30 to perform their hit songs and share the stories behind them. The first part of the anniversary kicked off at the Sundance Film Festival in January, and has continued with shows performed in Nashville, New York City, and London already in 2014. Other stops planned for the rest of 2014 include Austin, Nashville, New York and Paradise Island in the Bahamas with Bobby Pinson, Brett James, Caitlyn Smith and Kristian Bush. The series, which began at Joe’s Pub in New York City, has made 75 appearances in 13 cities with 127 artists sharing their tales. Tickets for upcoming shows can be purchased at cmasongwritersseries.com, or by calling (312) 337-3486.